“Our Constitution was made only for a moral and religious people. It is wholly inadequate to the government of any other. 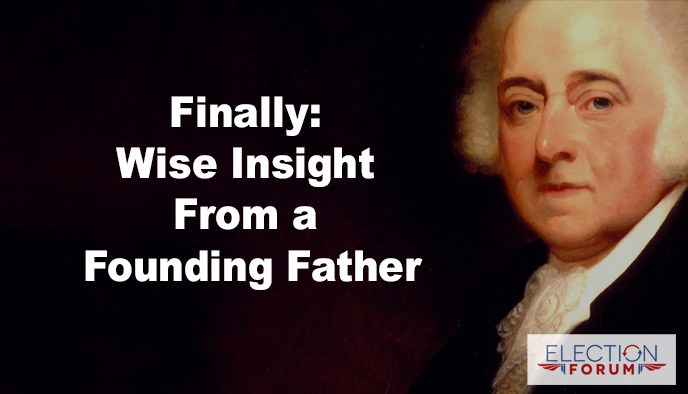 That quote is from John Adams, one of the country’s found fathers. Christians run for office, pray diligently for those in office, and use our influence to advance the spiritual awakening we so desperately need. In functional term, America’s survival is fully dependent on the 98 million claiming Christ in America atending churches where an unedited version of the Word of God is taught reminding them of their biblical obligation to represent Christ in government – to the exclusion of constitutional-deconstructionists politicians. The term ‘politicaly conservative’ is defined as resistence to change from the original intent of America’s amanded constitution (the rule of law in our constitutional-republic). In this, we see the GOP is no longer conservative. While ‘establishment’ operatives poisoning the GOP engage in socialism, fascism and globalism either directly or through fake-opposition to democrats, true conservatives (constitutionalists) are demonized as ‘isolationists’ and ‘anti-military’ because they are against America funding other nations and playing ‘global-cop’. To qualify as being politically conservative under today’s constitutionally-deconstructed version of conservatism, anyone using ‘conservative’ and ‘christian’ rhetoric while intermittently opposing democrats qualifies as ‘conservative’ – even though their record of governance evidences constitutional-schizophrenia at best. As for John Adams quote regarding morality being necessary for Americas survival, America’s moral condition is wholey determined by whether or not Christians find Christ worth representing in society and government. Based on Americas existing economically, educationally, media abomination, christian divorce rate, 55 million murdered unborn children, and constitutionally deconstructed condition, it is clear that church leadership is failing Christ and failing their flocks by not calling for biblically required representation of Christ in society and government. This, ensuring biblically defined morality is the basis for society and government to displace evildoers infecting America with societal and political pathologies. Martin Luther said we must fight the battle where it is the hottest. The battle right now is in confronting and overcoming Darwinism. In the apostle Paul’s day, at least people acknowledged the existence of some type or god or gods. Today we must first convince people that a God is possible. The best method of fighting this battle is in pursuing and understanding the intelligent design movement. I would encourage everyone to view the new video “Is Genesis History,” which was produced and narrated by Dr. Del Tackett. It runs an hour and 44 minutes and consists of 16 segments which cover various topics, mostly in science. And no, I’m not a salesman for the video.